While Nebraska is known for its vast amount of corn fields that flourish throughout the state, there are a group of smaller living organisms that may not be known to even the most faithful corn husker. While most spiders found in Nebraska are harmless, there are some that pose a threat to humans, animals and some plants. Most spiders and other insects in Nebraska are actually quite colorful and offer a sense of intrigue to those who come across their presence. While oddly shaped and sometimes terrifying looking, most of the spiders found in Nebraska are harmless. There are however a few spider species in Nebraska that can become quite deadly, so it is important to become familiar with the different varieties and the threats they pose to you and your family. One of the more popular spiders that calls Nebraska home is the wolf spider. Wolf spiders have a great deal of brown hair that covers their bodies, making them look a bit more intimidating than the average spider. 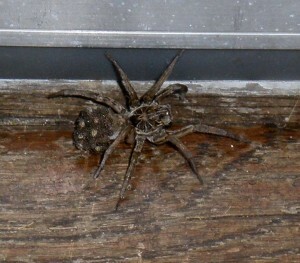 A wolf spider has eight eyes; two of which are larger and more prominent than the others. Wolf spiders depend on their excellent eyesight to hunt prey. They also have a very sensitive reaction to touch. Wolf spiders depend on camouflage for their protection, which means they do not have the flashy appearance that some other species of spiders have. They have been known to grow up to one and a half inches in size. One of the more threatening and potentially lethal spiders that have been found crawling around in Nebraska is the deadly Black Widow Spider. The black widow spider is black in color, except for a red hour glass shaped symbol that it proudly displays on its abdomen. Female black widows are poisonous while male black widows are not. Female black widows kill male black widows after mating, tearing the heads off completely. Black Widows are known to hide out in dark areas that are rarely disturbed. Bites often occur when people are reaching into a poorly lit area without seeing that there is a spider inside. If you are bitten by a black widow spider you must seek medical attention immediately as their bites have been known to be deadly. If you are not sure what type of spider is crawling across your floor, take extra precautions and call in the services of a professional pest control technician. Romar Pest Control technicians are skilled and experienced in dealing with all types of spiders and pests, keeping you, your family and your home safe from harmful or poisonous spiders. Contact Romar Pest Control today for the best pest control service available.